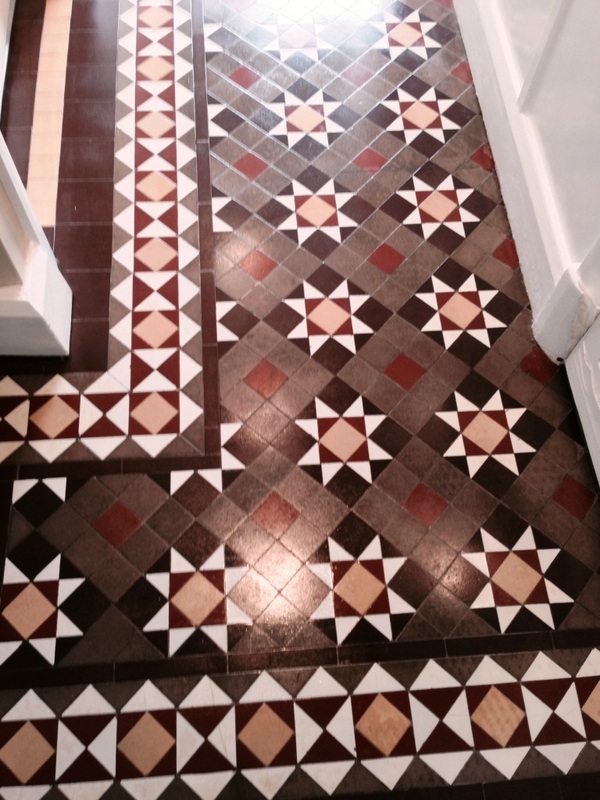 This Victorian Tiled Hallway at a house in Radford near Coventry had been well preserved under a carpet for many years and the owners of the house now wanted it brought back to life. Physically the tiles were in good condition however they did suffer from the usual issues of paint splashes and adhesive stuck to the surface. 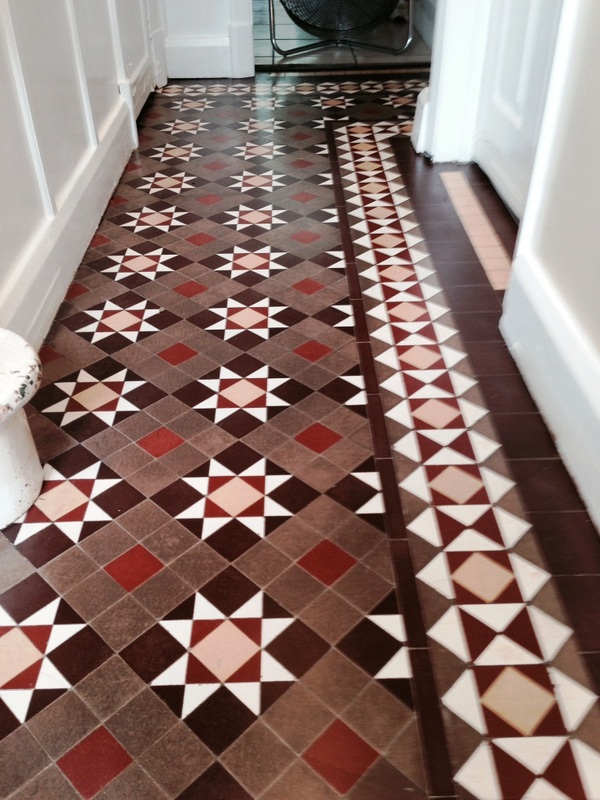 To clean up the tiles and remove the paint and glue I used a dilution of Tile Doctor Remove and Go. The edges of the floor was done first as this was where the most pain splashes were to be found due to the skirting being painted at some point in the past. The usual procedure still applied allowing the product to soak in and soften the paint before being scrubbed off by hand. 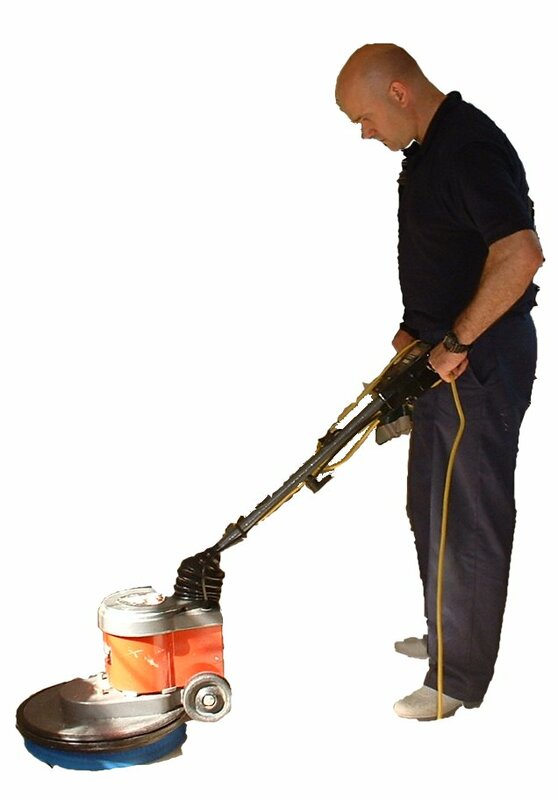 Once the edges were done I moved onto the main part of the floor using the same process however this time I had the advantage of being able to use a rotary machine fitted with a scrubbing pad. The dirty solution was rinsed away with water and removed with a wet vacuum. 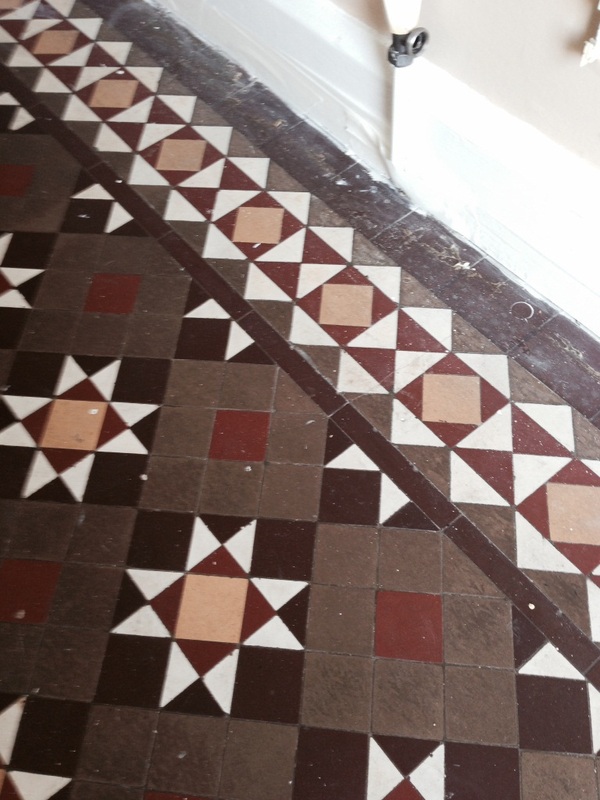 To finish off and remove some signs of efflorescence (white salt stains) the tiles were then scrubbed in a dilution of Tile Doctor Grout Clean-Up. This did the trick but you can’t leave this product on the tiles for too long as its an acid so as soon as it had done its job it was washed off and then the tiles were then given a thorough wash down with clean water. My work was done for the day so I left a fan running to help speed dry the floor overnight and left for the day. I came back the next day to seal the floor using Tile Doctor Seal and Go sealer which provides stain protection as well giving a nice sheen to the tile, the tiles were quite porous and needed six coats before they were fully sealed. 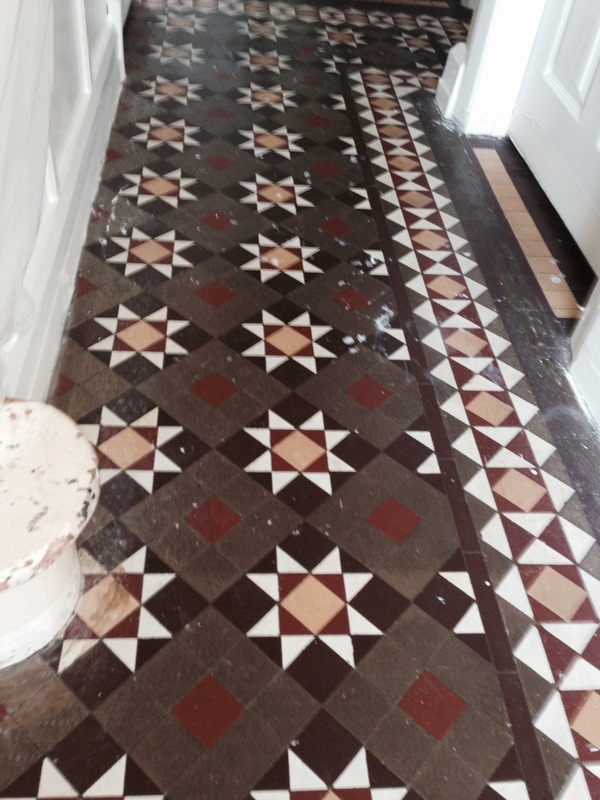 Popular as they are in the UK it wasn’t long before I was called back to refurbish another Victorian Tiled Hallway Floor this time in the town of Allesley near Coventry. 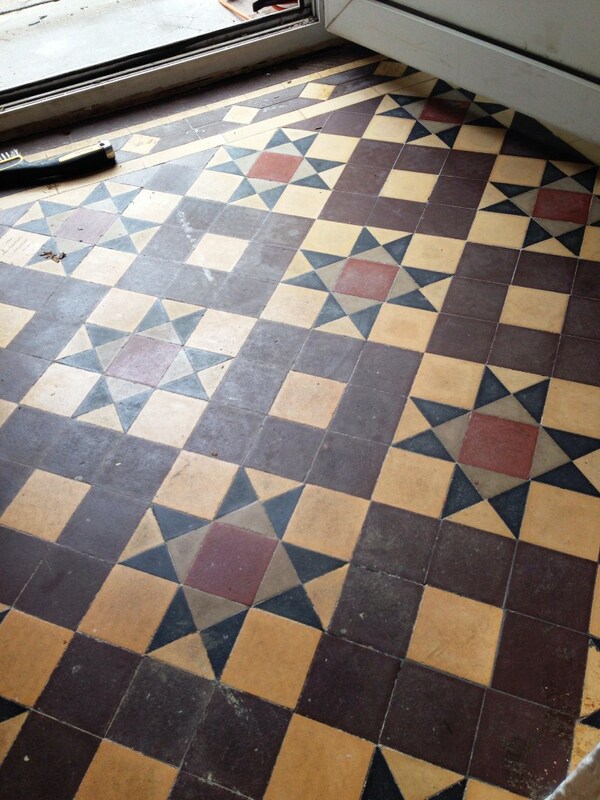 This tiles were heavily soiled and had been splashed with paint from decorating, on top of this there was evidence of adhesive from when the floor had been previously covered in carpet and there were a number of damaged tiles that needed replacing. 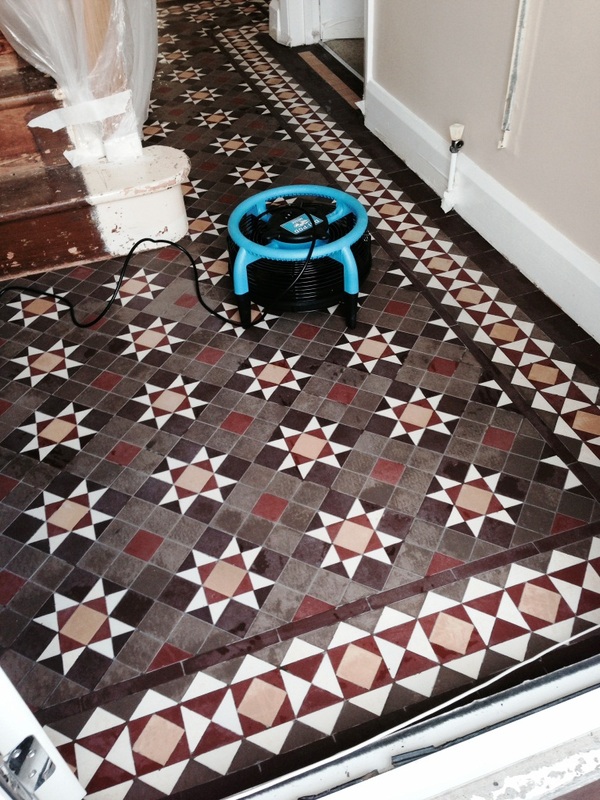 To get the tiles clean of paint and dirt I decided to go straight for a dilution of Tile Doctor Remove and Go which was left to soak into the tiles for around thirty minutes before scrubbing it in with a rotary machine fitted with a scrubbing pad. The dirty solution was rinsed away with water and removed with a wet vacuum and stubborn areas and grout re-treated with a scrubbing brush by hand. I wasn’t entirely happy with the condition of the tiles at this stage so the next step was to scrub in a dilution of Tile Doctor Grout Clean-Up which is an acid based product that removed grout haze, mineral deposits, rust stains and efflorescence. 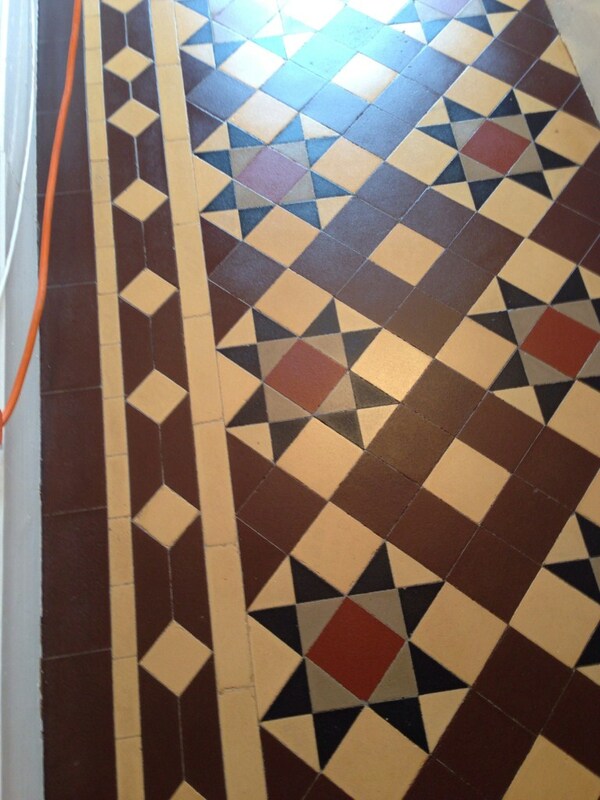 This did the trick but being an acid based product you can’t leave it on the tiles for too long and so was washed off soon after and the tiles washed down with clean water. 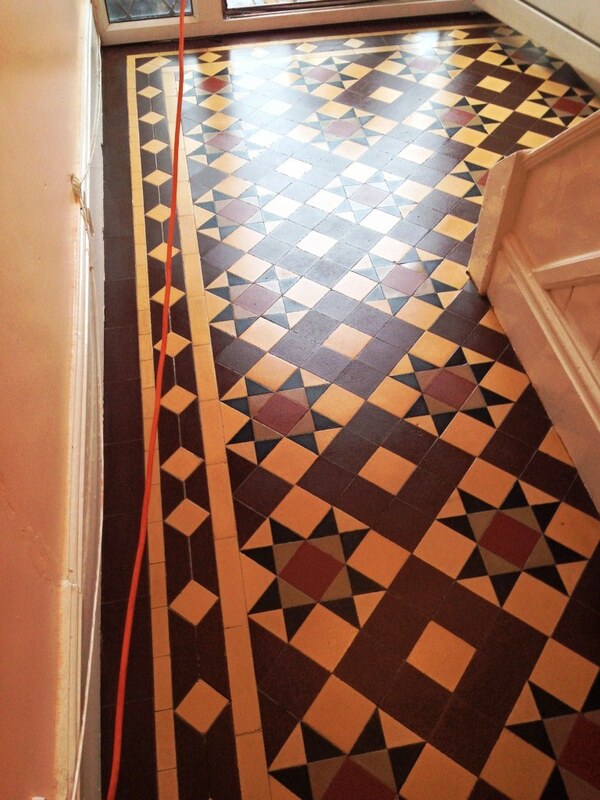 I scraped out the grout surrounding the damaged tiles and lifted them out, I had already arranged replacements so once that was done and tidied up it was just a question of putting the replacement in place with tile adhesive and re-grouting using a sympathetic grout colour to match the aged existing grout. My work was done for the day so I left a couple of fans running to help dry the floor and left for the day. I came back the next day to seal the floor using Tile Doctor High Shine sealer which provides stain protection as well as a very shiny finish; five coats were needed to get it fully sealed.